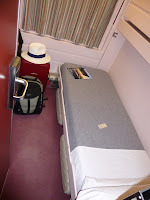 I reserved a first-class couchette on the Lusitania "train-hotel" to travel from Lisbon back to Madrid. I allowed myself this luxury since I've been able to do most everything else on the cheap. Thanks to my friends — FOC and MGG (and the latter's family) — most of my accommodation on this trip has been gratis, and the few hotels I've paid for have been quite cheap. 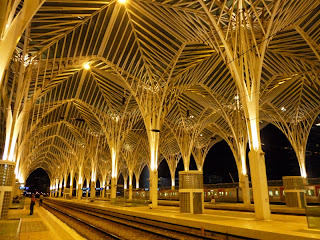 There are two options for catching the night train in Lisbon: at Santa Apolónia, the oldest railway terminus in the city, or at the more modern Oriente station 10 minutes later. 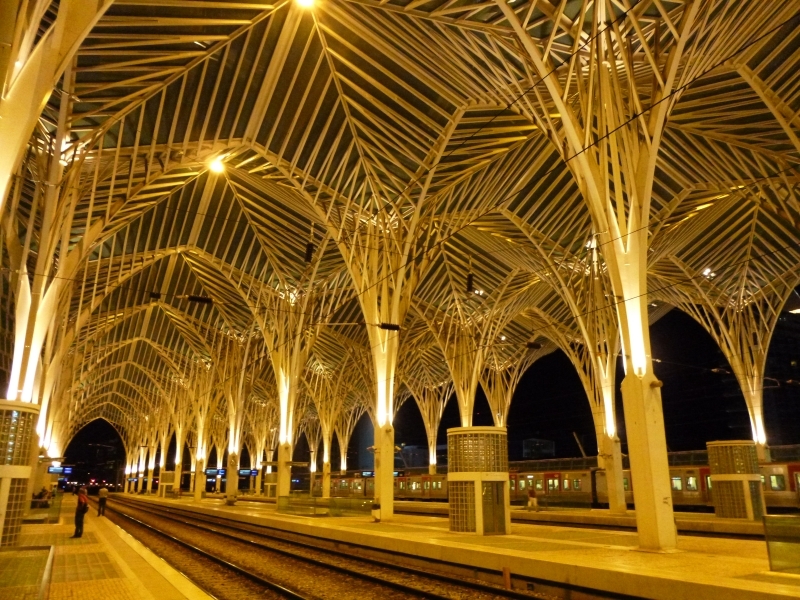 My hotel was closer to the former, but the website of Portuguese rail says that there is a VIP lounge at Oriente where passengers travelling first class can wait in comfort. 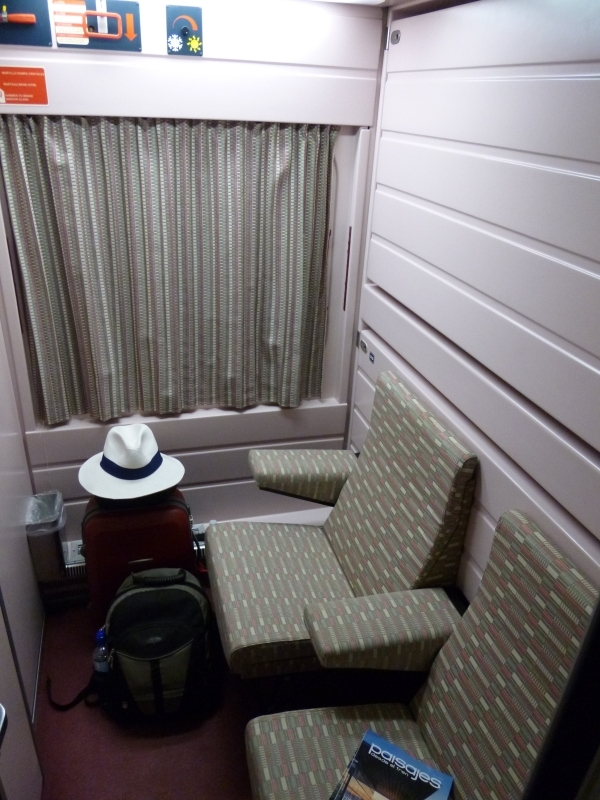 Having treated myself to a first class ticket, I decided to take the metro to Oriente to sample the style. A gin and tonic or a glass of fino would be just the thing to whet the appetite for dinner on board the train, maybe pick up a newspaper to kill an hour or so before departure. Bad decision! I waited longer than I expected for the metro, and again for the connecting metro. Then on arrival at Oriente I had to climb several flights of stairs. You'd think a metro station that serves the city's primary mainline railway station would have escalators given that a fair number of passengers will have suitcases. Luckily my case wasn't too heavy, but I sweated a bit all the same. When I found the first-class lounge I discovered that they meant "lounge" as in sitting room, not as in a place to have a drink. Water and coffee were on offer, except the coffee machine was out of order. There was a large range of newspapers in Portuguese, and no other language. The seats were plastic with a minimum of upholstery, and a few "designer" cubic stools were strewn about. The wifi worked fine. The difference between first class lounge and the standard waiting room is that it is surrounded by a glass wall so that people can see you are in first class, and you get access to the wifi. Once on board, however, things were quite different. 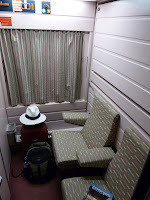 A charming hostess led me to my private cabin and invited me to relax for a few moments before going to the restaurant car. I had time for a shower (in my private bathroom) and a few minutes later the hostess came to call me for dinner and told me she would prepare my bed while I was dining. Dinner itself (included in the ticket price) was a pleasant three-course affair. Though not exceptional as a meal, it was very good compared to the usual fare served on trains. It's an à la carte menu with about five or six options for each course. A half-bottle of wine, mineral water, coffee and after-dinner liqueurs are included. I went to bed shortly after midnight. In the morning the hostess called me at 7.45 in time for a shower and breakfast before arriving in Madrid at 9, fresh, clean and well-fed. That's the way travel should be!